One of the most heart-wrenching things I’ve done since becoming a mother is to say goodbye to the baby stuff my girls have outgrown. When my oldest outgrew her baby clothes and gear, I tucked it away for the next baby (or babies in my case because I had surprise twins). I wasn’t mourning the loss of babyhood because I was planning on pulling out the boxes marked 0-3 months at some point in the future. Now my twins are 3 years old and the baby stuff I have tucked away is just collecting dust. This baby-making factory is closed indefinitely, so it’s time to let go. I wish I knew about the world of resale when I was pregnant with my first baby because there are so many great items to purchase for pennies on the dollar. Resale prices cannot be beat compared to what you would pay brand new at a big baby retail store, even with all the coupons in the world. Now I am on the other end of resale, not only making purchases for my toddlers, but trying to declutter my home, simplify and earn some cash back. Here are 8 resale trends you should know about. 1. Facebook Buy, Sell, Trade groups. many moms are well acquainted with these groups in their zip code or county. You can have a lot of success selling bigger ticket items like strollers, swings and outdoor play equipment. You’ll most likely get your asking price, but then you also need to arrange the drop-off/pick-up. 2. Craigslist. Not to be forgotten, I’ve bought and sold some great items like tricycles and bikes — because who wants to spend top dollar on something they’ll outgrow in a year? Be safe; if you are buying or selling items, meet in a public place. Some police stations allow you to meet up with your buyers or sellers in the parking lot. 3. Clothing should be in really good condition and priced to sell. Clothing is one of the tougher items to resell. On the flipside, clothing holds the most memories for me as a mom. Moms looking for clothing don’t care how much I loved seeing my baby in a particular outfit. Moms seek items with tags still on them, and nobody wants to put their bundle of love in a stained outfit (no matter how adorable it is). 4. Resale stores. Felice Pierce, owner of Revolve Kids in Lyndhurst, says the quickest selling items are equipment, like high chairs, pack & plays, exersaucers, doll houses and strollers. Children’s high-end sneakers sell well, too. 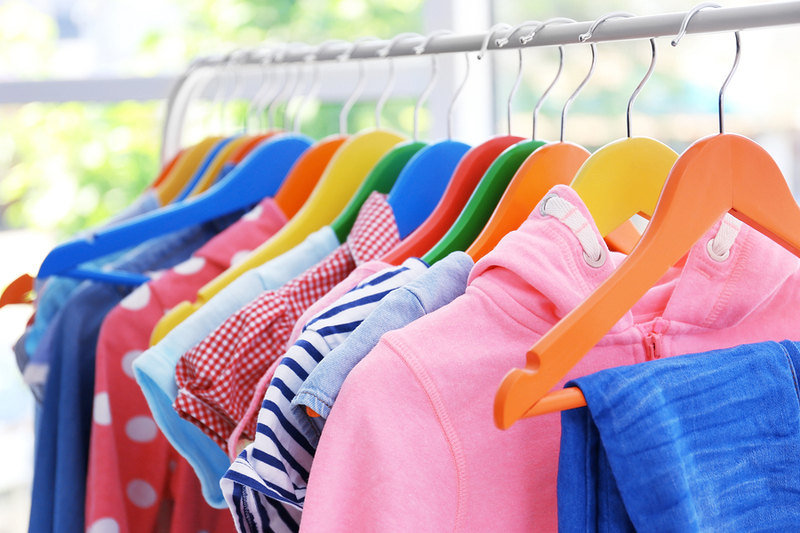 To get the most out of your resale items, take them to the resale store as soon as your child is done with them. This ensures the clothes are in-style. Revolve Kids typically purchases items new within two years. 5. Pop-up consignment shops and sales. Doing a pop-up consignment shop is less effort than having a garage sale and you’ll likely get a better price for your items. Jennifer Ryan, owner of Rhea Lana’s of Medina, recommends, “Price your items at 25-35 percent of retail. Remove the sentimental feelings with an item and always ask yourself what you would pay for this item.” Rhea Lana’s of Medina offers a mobile phone app where you can enter your items for sale, then track your sales throughout the live event. This event also offers one of the highest returns; about 75 percent of sales go back into your wallet. At Rhea Lana’s of Medina, almost all of the baby gear and toys are sold very quickly, sometimes within hours of the sale starting. Items in great condition and priced right sell fast. 6. Online consignment. This is a great option for moms who need convenience and simplicity. Online shops, like thredUP, mail you a bag to send in your items, and then they post and sell them for you. You can choose to get credit to the site or cash back. They can send back the items that do not sell, or donate them on your behalf. 7. Careful with car seats. I didn’t know this until I had kids, but car seats expire after so many years from the date of manufacture (most expire between five and nine years after being manufactured; check your car seat’s manual). Second-hand retailers will not sell them for this reason, but also because you cannot guarantee they have not been in a car accident. If a car seat has been in an accident of any kind, it must be replaced. Auto insurance should cover the cost. 8. Do not resell or reuse breast pumps. Most pump motors do not last well with long wear and tear, and bacteria and germs can get trapped in the different pieces and parts you cannot wash. Lactation experts recommend you call your insurance provider to see if you are eligible for a new pump. Even after all your prep work, there will be items that don’t sell. It’s a hard pill to swallow when you see the items you loved are clearly not valuable to others. I find this is where donations and finding a worthy cause softened the blow. You can find different charity organizations like Laura’s House, Haven of Rest, The City Mission, and Lakeview Christian Church Children’s Clothing Swap through Google. I personally like giving clothes to friends who I know will really appreciate them (like other twin moms). Knowing another baby will get use out of my items and cherish them the same way I did lessens the sting out of letting go of my favorite onesie or tutu skirt. Moreover, I may see it again in-person or in photos posted on social media, so it’s not necessarily goodbye forever. Click here for a list of area resale events taking place this season, or check our Resale Store Directory for resale and consignment shops near you.